Local pastor vows to destroy Satanic exhibit if it goes on display in Boca Raton, FL park. 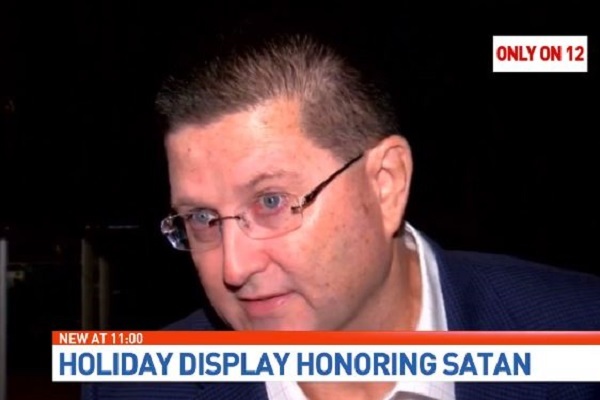 Boca Raton Community Middle School teacher, Preston Smith, has caused fury among parents and local Christians of the Southern Florida city as he plans to put up a Satanic display in a park during Christmas season this year. This act is to protest the display of Nativity scenes, which is an annual exhibit in the same park every winter holiday season. The middle school teacher said the “May the Children Hail Satan” is an artistic expression of defiance toward the Sanborn Square nativity scene, which performs an annual re-enactment of predatory indoctrination in a public park targeting young children before they have critical thinking skills.” He added that he does not believe in Satan or God, who he believes are clearly fictional characters whose existence cannot be backed up by any science. Smith has also made similar displays during last Christmas for the same reason. But he claims that he does not preach his beliefs inside the classroom. “Students have an uncanny ability to be more tolerant, respectful, and educated about diversity than most adults. There is a mutual understanding not to discuss the display with me on campus,” he said. As expected, local Christians are infuriated by Smith’s plans. Pastor Mark Boykin from Church of All Nations said that this is like “a welcome mat for Satan” and called it “the essence of evil.” He goes so far as to even vowing to personally break down the display with a sledgehammer. Jeremy Rodgers, Deputy Mayor backed her up saying that they have been advised by their lawyers not to do anything because it would be an expensive lawsuit the council cannot afford to bear. The "entertain me" and "satisfy me" church mentality has put out a welcome mat for Satan and given him a seat on the front row. Even though Smith may be in the clear legally, many parents have expressed their wish for him to stop teaching. But Dr. Robert Avossa, Superintendent of Palm Beach County School has said that they are not in a position to dictate what a teacher does outside of school.